The artistic treatment of the serpent – or snake – in the tradition of the Hindu Nāga worship and the Judaeo-Christian interpretation of Nehushtan, Moses’ so-called “copper snake” along with other possibly related Western symbolic figures (e.i. 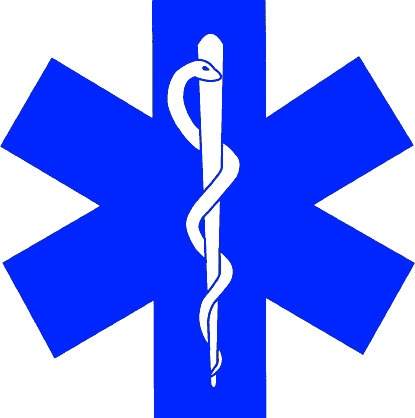 the caduceus, and the rod of Asclepius), vary considerably in the manner in which they are depicted. The aesthetic styles used to represent the serpentine divine will be explored in this brief article devoted to taking a look at how snakes still possess and evoke powerful symbolic meaning in both culture and religion. described as having many heads and being of different hues. The Nagas live in beautiful underwater palaces in Bhagavati or, according to other myths, under the earth in Nagaloka. Their wives, who are called Naginis, are said to be extremely beautiful. They are ruled by their king, Ananta-Shesha, who protects and supports the god Vishnu […]. In modern Hindu belief, Kārkotaka is the king of the Nagas that controls the weather, especially the coming of the rains. In surveying the use of the Sanskrit term nāga (“cobra”) in relation to myths in general, there is an important distinction to be made. Other languages and cultural groups outside of India have borrowed the term – mostly through the spread of Buddhism – and because of this the Sanskrit nāga can be found to be used in Indonesia, Thailand and West Malaysia (Rose 2000: 261). A nāga in these non-Indian cultural traditions usually represents something along the lines of what in English could best be described as a multi-headed dragon (ibid. 261), whereas in the Indian mythic tradition a nāga is simply a “snake”, and is the generic term for the sneaky animal in many languages in the Indian subcontinent today (whether belonging to Āryan or Dravidian language families) (Apte 2002: 432). The Nāga, therefore, in the Hindu tradition is strictly a “cobra/serpent/snake” figure. 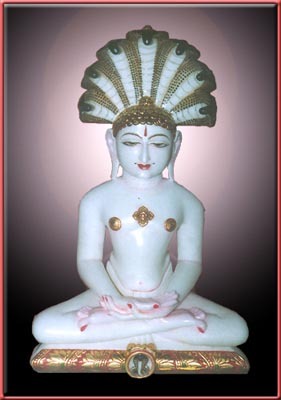 One of the most important Hindu Nāga figures or one of the “Principal Nāgarājas”, as these popular Nāgas are referred to by Hindus, is without a doubt Śesha (read: Shesha) or Ananta the World-Serpent (Vogel 1926: 190-92). Above Śesha appears in one of his more popular positions as the serpent-bed of Vishnu, the latter deity floating on the crowned twelve-headed marine nāga. This image is one of the more significant ones that appear of Śesha protecting and supporting the god Vishnu. Because of its importance in Hindu mythology in relation to the Hindu myth of the “churning of the Ocean of Milk”, Śesha is therefore considered as a king among nāgas since he was essentially used as a rope by the gods in the myth (Turner & Russell Coulter 2000: 421). 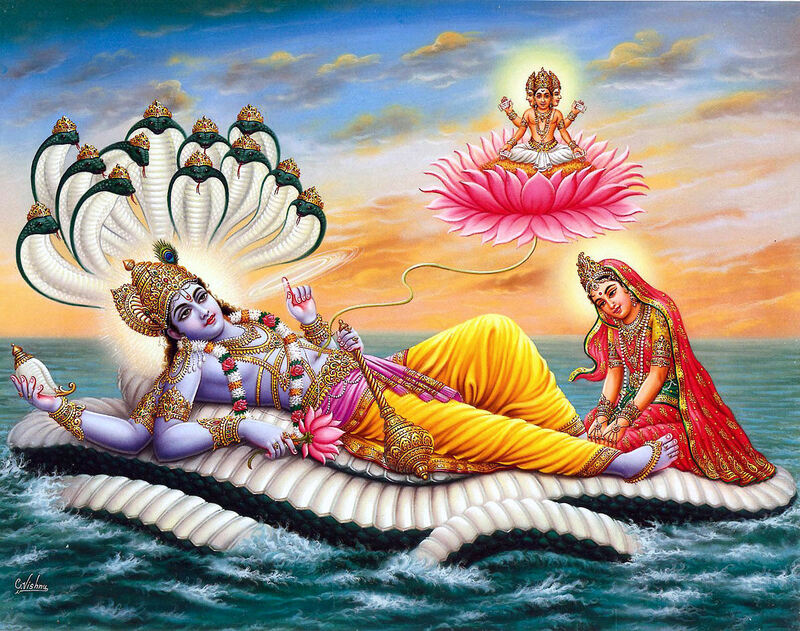 It is for this great important reason that Śesha’s multiple heads are crowned by the numerous appreciative deities in the myth, but nevertheless the serpentine body is neatly distinguishable as such as Vishnu lets himself be cradled comfortably in the nest of Śesha rather large body. 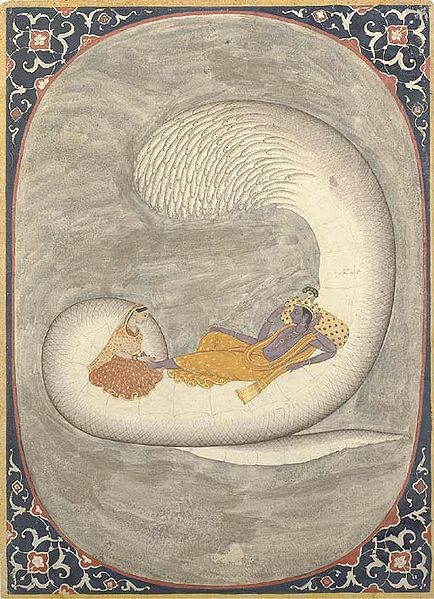 This much is clear in Image 1, whereas in the following, in Image 2 (see below), the body of Śesha forms a “couch” or bed in much the same way, but this time it is nearly indistinguishable as the body of a snake (nāga). The heads once again appear in multiples here again, but instead of having one large serpentine body as in the first image, Śesha’s body (in Image 2) appears to be the result of an innumerable mass of flattened snakes all fused together for lack of a better description. And the exaggerated form of Śesha in the next image (Image 3 below) is even more so less recognizable than the previous serpentine body. Arguably, Śesha appears to be monstrously disfigured in this particular artistic representation the mythic being. For instance, for those individuals who are totally unfamiliar with the particular Hindu mythic subject matter in Image 3, would be hard pressed to find any resemblance in the imagery with that of a serpent’s body. The humongous size of Śesha in the artwork merely attests to the great importance of the role it plays in the myth. If we compare such a divine or royal, beautifully enlarged and lustrous creature such as represents Śesha in Hindu mythic artwork; in stark contrast, the Judeo-Christian tradition of representing snake/serpent creatures is usually not executed in such a positive light. For instance, in the biblical tradition, the Nehushtan or bronze (or copper) serpent raised by Moses on a pole “in the desert in order to heal the Israelites from the bites of the poisonous serpents to which they were exposed (Num.xxi.4-10)” (Hirsch & Ochser 2002: 212-13) does not enjoy such an exalted status in the Judeo-Christian tradition as does Śesha in Hinduism. Although, it could be argued that there is a similarity, since undoubtedly both Śesha and the Nehushtan are associated with the divine in some way or other; with Śesha serving as a rope for the gods, and for the Nehushtan to heal the Israelites in the desert through God’s instructions to Moses in creating it. So in a manner of speaking, structurally, the Nehushtan is God’s will to heal on earth through its serpentine figure which symbolically serves as a ladder, which is in a way comparable to a certain degree to Śesha being used as a rope to heaven by the gods. 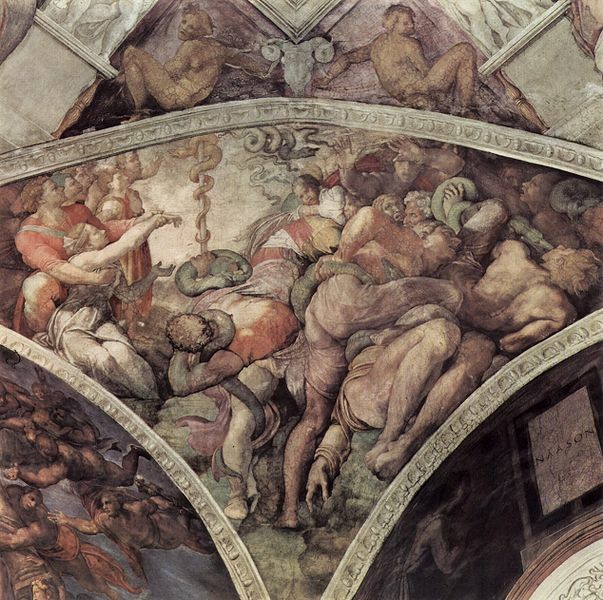 In examining the above Image 4, in Michelangelo’s famous fresco painting on the ceiling of the Sistine Chapel, there can be seen illustrated a crowd of Israelites seeming to wrestle with both evil and vile serpents – seemingly trying to bite, strangle – in short, they are trying to kill them. But alas! in the background mounted on the pole is the brass – or copper-coloured – Nehushtan, facing several bitten Israelites that are probably looking to be rid of the evil serpents’ venom. One of the men (with quite large biceps) can be seen offering what could be considered as his wife’s gentle hand as he cups her breast lovingly. This contrasts sharply with the flying green snakes in the foreground, these evil creatures that are attacking the fearful Israelites. All this frightful scene, Michelangelo seemed to try to depict occurring behind the Nehushtan’s back (in the upper right half of the painting), where the coiled-up green serpent appears to lead the charge in the attack. There is both reverence and fear represented in the serpentine figures of this fresco. 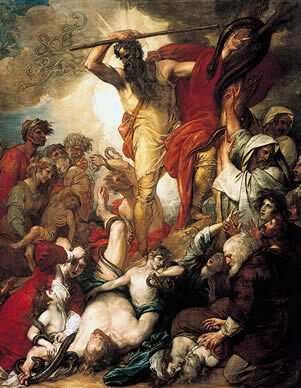 There is much the same treatment of the Nehushtan in the painting above, in Image 5, this one a famous work by Benjamin West in which in it Moses appears, holding a staff, seems to be gesturing to the enormous snake coiled up around the pole next to him – the Nehushtan, in the upper right quadrant. The scene can arguably be interpreted to mean that Moses is telling the Israelites that this giant ugly-looking snake next to him on the pole – or tree – can heal them from other vile snake bites they’ve endured. Once again, much like in Michelangelo’s painting (Image 4), this newer version by West (Image 5) employs a dramatic scene with a mob being attacked from all sides by smaller snakes with the promising miracle snake Nehushtan appears to bear some kind of a promise of a cure from certain death. There also appears in West’s painting an homage paid to the Laocoön “by adapting the sculture to an Old Testament subject, just as Michelangelo had done in the spandrels of the Sistine ceiling” (McCarthy 2008: 170). 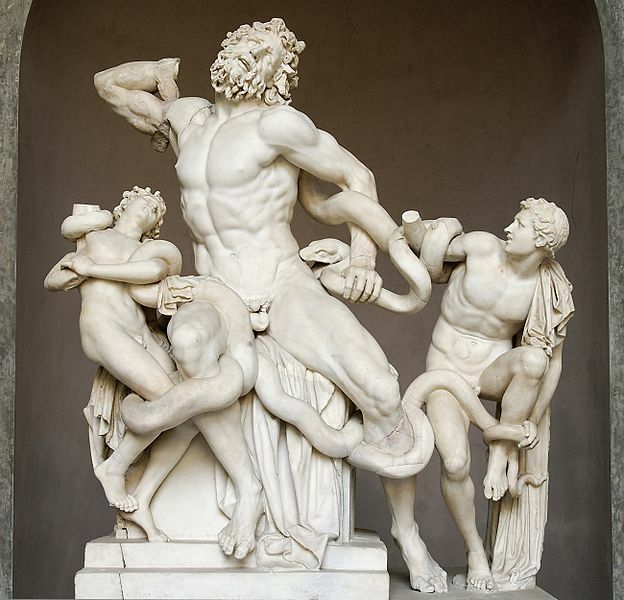 In the lighter painted portion of The Brazen Serpent, similar to the marble statue of the Laocoön (see following Image 6 below), West has painted overthrown individuals coiled up in snakes – a direct reference to the snakes that Athena sent down from heaven. In all of these artworks, the snake/serpent as the main subject clearly dominates the scene being played out. The size of the serpentine divine appears much greater than that of the average snake. Whether coiling around a poll as the biblical Nehushtan or in its exaggerated form as Vishnu’s serpent-couch, both religious artistic traditions depict it as a larger-than-life figure. Aesthetically, of course Śesha could be termed to be quite abstract in style compared to the realist paintings of the Nehushtan. 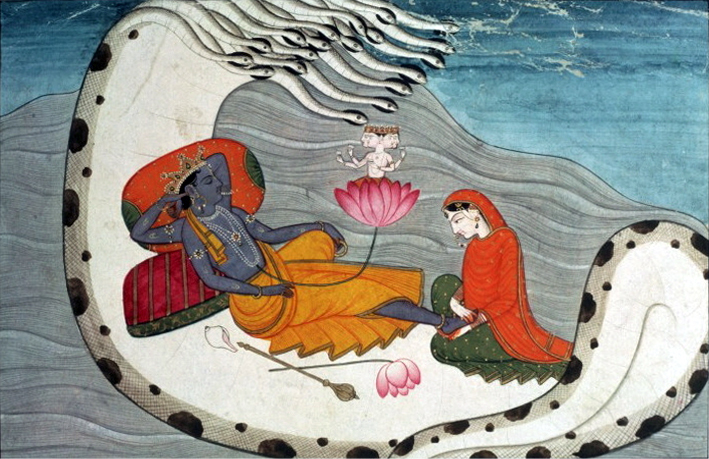 Another distinction to be made is that when looking at the Śesha depictions with Vishnu in relaxation mode with a prostrate Lakshmi in front of him (in Images 1 to 3), and in the first two images (Images 1 and 2) Brahma is flying on a lotus flower, hovering about; in short, in these settings where Śesha appears, there is an undeniable otherworldy mythic feeling to the colourful art. Whereas the contrary can be said of the Nehushtan representations since they cast the grand serpent as realistic – although rather on the large side – and that it is an earthly worldly setting – in a place where people usually fear the snake’s venom and this often as much as they fear the creature itself. Images 4 and 5 are filled with human emotions of fear and the blessed sign of the miracle embodied by the Nehushtan as it has been sent by God through Moses to save the poisoned Israelites; this certainly helps explain the settings for these two images, since the paintings are demure, dark, yet both contain a promise of light in the background surrounding the heavenly sent Nehushtan. Śesha, on the other hand, is pictured in a colourful – almost blissful – setting, the Hindu tableaux always seeming to be filled with awe, quiet wonderment. This is most likely an accurately described feeling of peace and amazement evoked by the artist, since traditionally, Śesha, along with Vishnu resting on him, have both just finished their business of creating the universe. With such wonderment at hand, details in depicting such wonderful and holy beings, as a realistic-looking World-Serpent Śesha, could have been seen or interpreted to be quite frivolous in regards to what the onlooker is witnessing in these representations. Clearly, the subject of Śesha and his divine companions are not ‘of this world’, they are ‘of the light’ and so they all shine in their own mythic world where the artist has attempted to convey this heavenly gaze to the spectator. The Judeo-Christian tradition and depiction of the Nehushtan is not only dark and demure, but it is also representative of a religious tradition that is steeped in history – real human history – sine the Hebrew Bible does not consider Moses and his Nehushtan to be otherworldly in quite the same way as Hinduism considers Vishnu and Śesha. Moses and the Nehushtan play out their biblical scene in the real world, in an earthly world where the artists depict suffering and death, danger and promise, and this frames the Nehushtan in a very worldly setting that the viewer can relate to. Most interestingly, the feelings evoked in both the Hindu and Judeo-Christian mindsets in regards to this common theme of the serpentine divine sacred imagery is quite consistent with the manner in which this creature is usually seen in their respective environment. In the West, as inheritors of the Judeo-Christian tradition, through their bad biblical reputation where snakes have most often been vilified, people have a tendency to fear the creature. 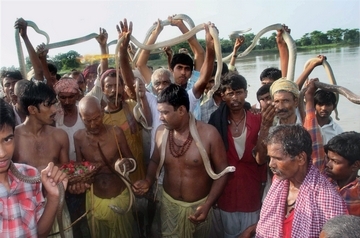 On the other hand, in India, because of many ancient beliefs that place the Hindu Nāga in high esteem as either an important fertility symbol, or the fact that is intimately linked with specific aspects of dharmic/religious holiness (such as demonstrates the mythology of Śesha) has helped to preserve the everlasting tradition of snake worship. The Nāga is a positive image. Nag Panchami is a Hindu Festival celebrated in the month of July or August. 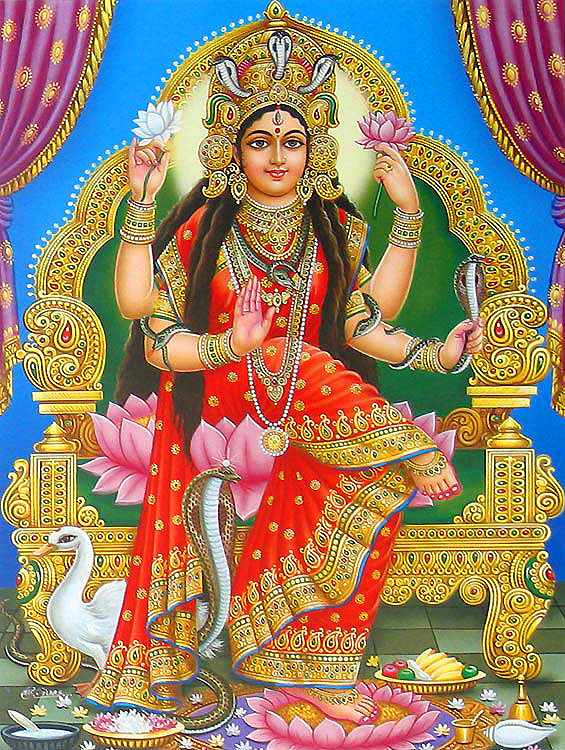 For example, in the East, snakes are a common motif in temples, and are even shown to “crown” many important religious/dharmic figures – in this sense, this artistic tradition of wearing the Nāga “crown” in Indian art serves a similar function as a halo does in Western religious spiritual “crowns”. 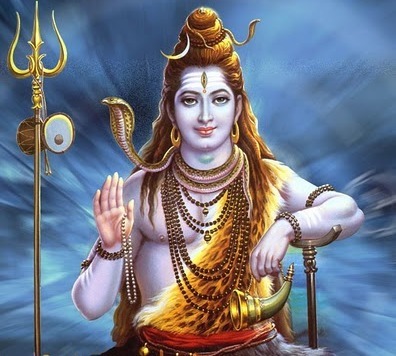 The Hindu god Shiva often wears a snake coiled around his upper arms and neck symbolizing the power he has over the most deadly of creatures. There is even a Hindu folk Goddess of Snakes and Poison, by the name of Manasa (Manasha, also Mansa Devi), who is widely worshipped (see Image 6). 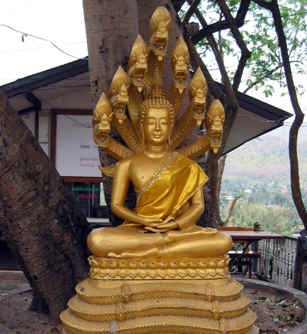 Moreover, it is even customary in some areas to have or house idols of snake gods – Naga Devatas and Naga Devas. The same cannot be said of the Judeo-Christian world where there seems to be a cultural inheritance of disliking or distrusting snakes which is most likely related directly to Biblical lore (as can be seen in Image 7). Image 8: Michelangelo’s "The Expulsion from the Garden of Eden"
Michelangelo's Sistine Ceiling painting shows the Serpent giving Adam and Eve fruit from the Tree of Knowledge. Yet, in analysing the biblical “healing properties” of the Nehushtan as presented in the Bible (Num.xxi.4-10), there is a striking parallelism that exists today in the modern era which was also inherited from the ancient world and that could also possibly be related to ancient practices similar to that of Moses raising the snake on a pole to cure the bitten Israelites. In exploring the motif of the Nehushtan, this fact warrants discussion in order to see that there is actually some positive imagery or symbolism concerning the snake that was inherited or transmitted to the West down through the ages. Whether the imagery of the Nehushtan be responsible directly or not for the artistic motif of the symbol commonly found for medicine in apothecary store-windows or pharmacies in North America, assuredly there is either a direct inheritance that has come down to us from the ancient world if not through biblical lore then perhaps from a commonly shared cultural source. 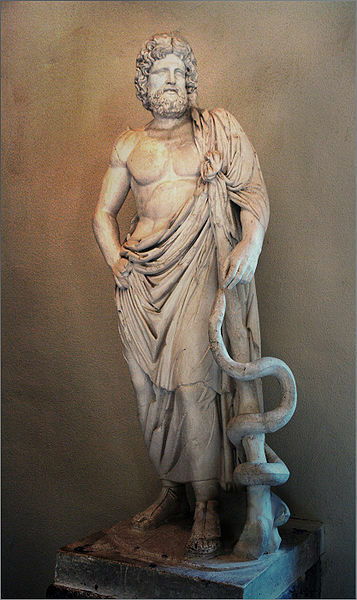 These other related contemporary Nehushtan-like divine serpentine figures are the caduceus (see Image 8 below) and the rod of Asclepius – the name of the Greek god of medicine (Image 9). Here is a local example of the use of the caduceus as part of the Ontario Medical Supplies logo. Both the caduceus and the rod of Asclepius retain a symbolic significance with their relationship to medicine and healing. Another local example from here in Ottawa in relation to the use of the rod of Asclepius is the logo of The Academy of Medicine Ottawa, a branch society of the Ontario Medical Association (the A.M.O. represents Ottawa physicians at the local and provincial levels). It appears that even if most people possibly ignore and often take for granted the existence of these powerful snake symbols in our everyday surroundings, they do nevertheless possess some of the same healing powers similar to that of Moses’ Nehushtan, and to a certain extent those positive Nāga figures in the East. Undoubtedly, many individuals would be quite surprised to learn of the great antiquity of the use of these magic snakes in our modern healthcare facilities and medical associations. Although the Nehushtan is mostly relegated to biblical lore and religious specialists, the symbol of the rod of Asclepius, on the other hand, can be seen while driving down most main city streets across North America. Without going too much into any great detail about the presumably commonly shared ancient origins with Moses’ Nehushtan, it is sufficient to mention that the rod of Asclepius has undergone a sort of evolution or transformation in recent times. The reason for this is due to a confusion with the similar or comparable image of the caduceus (also called the wand of Hermes), and the fact that it was mistakenly the latter – a staff entwined by two serpents and a double helix and which is sometimes surmounted by wings – that was adopted by the U.S. Army Medical Corps in the 19th century by mistake instead of the rod of Asclepius (1). Due to this inherited confusion, the end result is that the two, both the rod of Asclepius and the caduceus are currently used in relation to being a popular symbol of medicine. According to a U.S. study, “A 1992 survey of American health organizations found that 62% of professional associations used the rod of Asclepius, whereas in commercial organizations, 76% used the caduceus” (2). Evidently, even if as an artistic motif the Hindu Nāga does not enjoy such commercial popularity as does the imagery of the Nuhushtan et parenté, it can still be said that the fact remains – that both in the East and West – the divine serpentine tradition continues to exist in various ways as it did in ancient times, and it plays an important part in our symbolic values, whether they be cultural, religious or commercial. (1) In regards to the history of this confusion between the caduceus and the rod of Asclepius, see the following: Wilcox, Robert A; Whitham, Emma M (15 April 2003). "The symbol of modern medicine: why one snake is more than two". Annals of Internal Medicine; http://www.annals.org/cgi/content/full/138/8/673. Retrieved 2007-06-15. Lt.-Col. Fielding H. Garrison, "The use of the caduceus in the insignia of the Army medical officer," Bulletin of the Medical Library Association 9 (1919-20:13-16), noted by Engle 1929:204 note 2. (2) Quoting the Caduceus Wikipedia article which references Friedlander, Walter J (1992). The Golden Wand of Medicine: A History of the Caduceus symbol in medicine. Greenwood Press. Image 6: Laocoön and his sons, also known as the Laocoön Group. Artists: Hagesandros, Athenedoros, and Polydoros. Marble, copy after an Hellenistic original from ca. 200 BC. Found in the Baths of Trajan, 1506. Current location: Museo Pio-Clementino, Octagon, Laocoön Hall. Source/Photographer: Marie-Lan Nguyen (2009). Apte, Vaman Shivram. The Student's English-Sanskrit Dictionary, Motilal Banarsidass (reprint edition), India, 2002. Hirsch, Emil G. & Schulim Ochser. “Nehushtan.” The Jewish Encyclopedia, 2002. McCarthy, Erik. William Blake’s “Laocoön”: The genealogy of a form. (Ph.D., University of Kansas, 2007) ProQuest Information and Learning Company, Ann Arbor (MI), 2008. Rose, Carol. Giants, monsters, and dragons: An encyclopedia of folklore, legend, and myth. W.W. Norton & Company, Inc., New York (U.S.) & London (U.K.), 2000. Turner, Patricia & Charles Russell Coulter. Dictionary of Ancient Deities, Oxford University Press, 2000. Vogel, Jean Philippe. Indian serpent-lore: or, The nāgas in Hindu legend and art, Kessinger Publishing, London, 1926.